Paris, Typis Josephi Barbou, 1755. 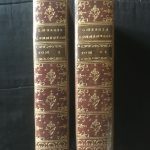 12mo, 2 vols. Vol. 1: frontispiece, 2 leaves without signature (half-title and title), pp. 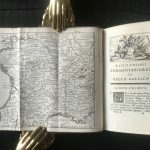 xxvii, 360, plus 2 fold-out maps; vol. 2: 2 leaves without signature (half-title and title), pp. 455 (1), 2 fold-out maps, plus a final leaf with publisher’s catalogue. 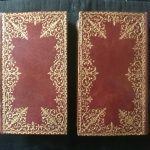 Fine crisp volumes bound in burgundy morocco, with elaborately gilt-tooled foliated designs stamped in gilt on spines and covers, gilt dentelles, labels in green morocco (slight loss to head of spine in vol. 2, light stain towards tail, blue silk endpapers, a.e.g. 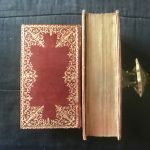 A lovely binding. 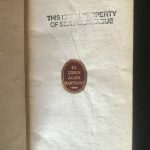 Ownership medallions of James Hartmann glued on the recto of first front fly leaves of both volumes. Hartmann was a C19th English book collector, especially of French editions; then this work entered in the Silke Montague collection, as shown by stamps found above the Hartmann bookplates. 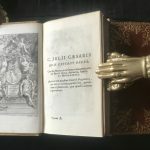 Barbou’s elegant edition of Caesar’s commentaries, with supplements by his general Aulus Hirtius. 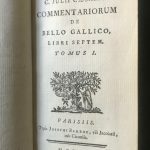 This was part of a library of the classics prepared for this publisher by A.U. 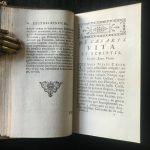 Coustellier; the catalogue as of 1755 is found at the end of the second volume here. For the aid of the book-collector, a list of editions of Caesar, from the first, Rome, 1469 (now Goff C16) onwards, is added to the works.